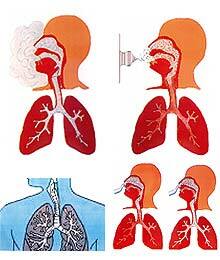 The healing capabilities in the use of inhalation therapies are numerous. 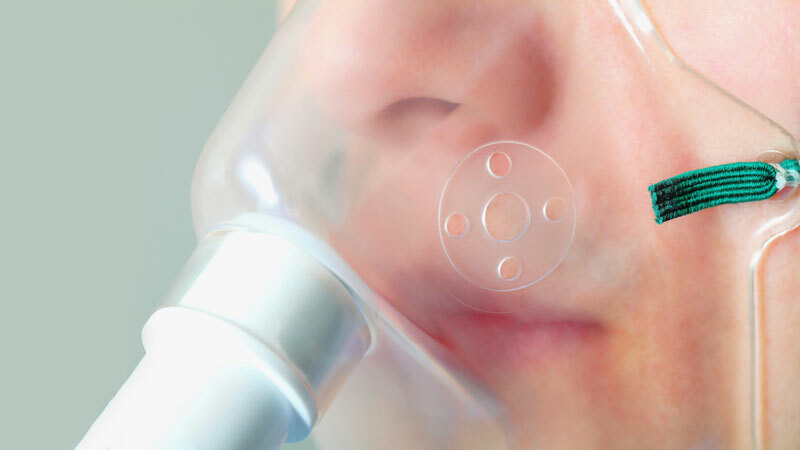 In diseases of the respiratory tract, inhalation therapy is particularly effective in the treatment of: recurrent bronchitis, chronic catarrhal bronchitis, bronchial asthma and emphysema in the forms associated with the presence of mild to medium levels of inflammation. 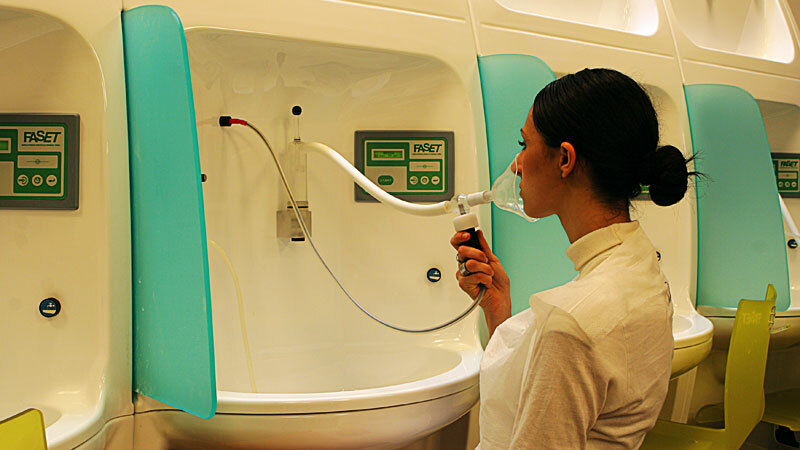 The purpose of inhalation therapy is to bring the mucous membranes of the ear-nose-throat system into contact with fragmented mineral water and the gas contained within it. Depending on the type of technique used for the fragmentation, it is referred to as inhalation, aerosol, or insufflation. 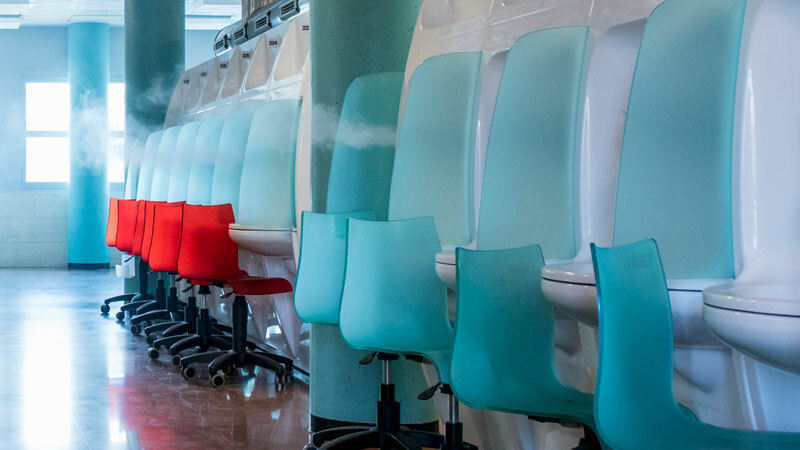 Nebulisation is a collective treatment, thethermal wateris released, in the form of a dense, humid mist, consisting of countless minute droplets of mineral water suspended in a common saturated environment, where the patient will be held for the duration of the application. 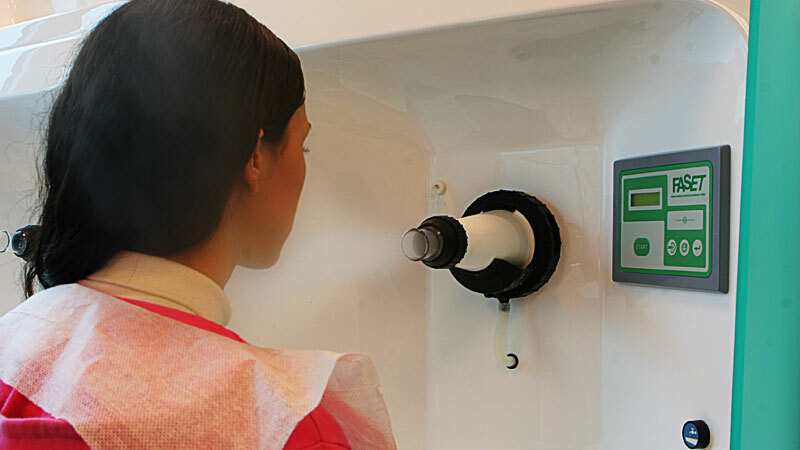 Humage is a therapeutic treatment based on the inhalation of gases present in thermal waters. It is a dry inhalation treatment and is ideal for reaching the lower respiratory tract and the tiniest of the pulmonary alveoli. To release the gases, the compressed air is passed through a collection vessel full of thermal water. The bubbling generated releases the active ingredients of the water that, on gathering in the upper part of the vessel, are pushed via air pressure, up into the patient's mask. This variant of aerosol therapy, conceived by the French physiologist Guillerm, is distinguished by the association of a 100-Hertz (Hz) sound wave to tiny particles of sulphurous water at regular intervals which, on acquiring a special kinetic flow, empowers them to penetrate into cavities of the paranasal sinuses and middle ear through the Eustachian tube. During the sonic aerosol treatment, the patient must frequently swallow: this action closes the posterior link between nose and throat via the soft palate, causing the pressure to increase in the nasal cavity and thus enabling the aerosol micelles to enter into the paranasal sinuses and into the tympanostomy tube. Sonic aerosols are specifically used for chronic rhinosinusitis and adjuvant in the treatment of chronic catarrhal otitis media and chronic catarrhal otosalpingitis. The water aspirated from the compressed air is let out so under pressure. Fractionation is thus obtained in very small and homogeneous particles with a diameter of 2-4 microns. It is a stand-alone treatment and can be performed orally or nasally by means of a suitable nozzle or nasal fork. With the aerosol, the deep airways are penetrated as far as the pulmonary alveoli and it is indicated in the treatment of chronic diseases of the upper and lower airways; nose, pharynx, larynx, trachea and bronchial tree. 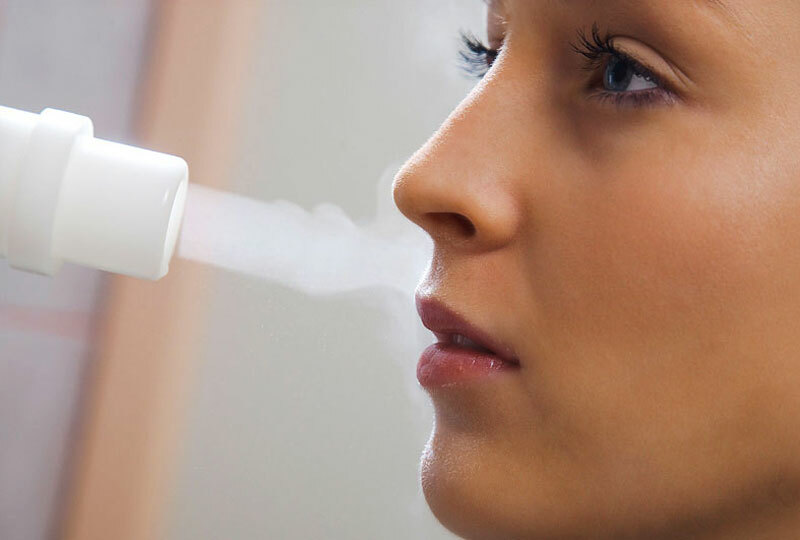 The ionised aerosol is a special type of stand-alone inhalationtreatmentin which the aerosol-therapy is combined with flowing thermal water and negative aeroionotherapy. The treatment is carried out using a special device that provides a negative electrical charge to the aerosol particles. The electrical charge prevents the particles from joining together, and thus enabling them to reach deeper into the airways. It also makes it easier for the aerosol particles to be absorbed by the respiratory tract’s mucous membranes resulting in better utilisation of the oxygen on a cellular level, and performing an intense antiallergic action. Thecureis performed with a special mask with which it is possible to administer the aerosol therapy either nasally and orally. This special inhalation treatment is suitable for allergic and non-allergic vasomotor rhinitis and in rhino-bronchial syndromes and chronic bronchitis. 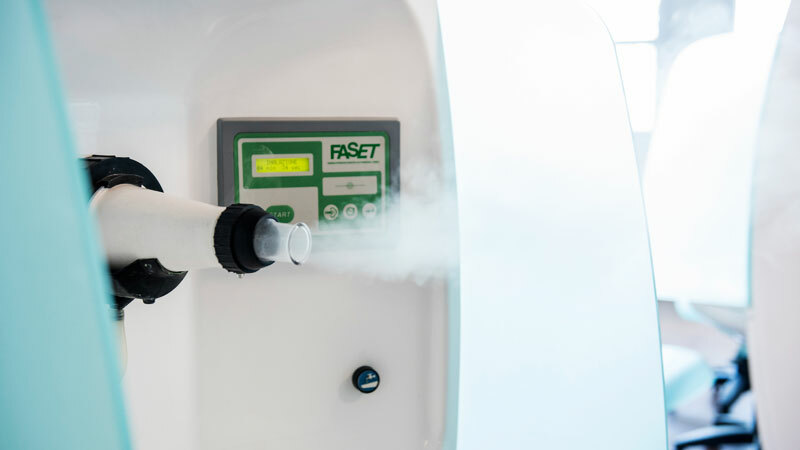 Steam jet inhalation is generally provided as a preparatory treatment to inhalation treatments as the vasodilation effect from the steam prepares the tissues for the absorption of the active principles then delivered by the aerosol. Atomised thermal water particles of 8 to 10 microns in size at 36-37 ° C are produced which can reach the upper respiratory tract (nose, paranasal sinuses, pharynx, larynx, trachea and lower bronchi). It is a stand-alonetreatmentdesigned to fluidise secretions present in the nasal cavity and in the rhinopharyngeal and pharyngeal zone through an abundant flow of thermal water particles. It is particularly suitable for all chronic catarrhal pathologies of the nose and throat: rhinitis, rhinosinusitis, rhinopharyngitis. It is useful in secretory otitis media (or otitis media with effusion) in children and chronic otosalpingitis in adults. Ourthermal watershave been used to cure rheumatic ailments since Roman times. Their analgesic and anti-inflammatory effect makes them still an important weapon today in the prevention and treatment of degenerative diseases of the bones and joints, whether in the form of mud, or hot baths withhydromassage. Sulphurous water, as a shower or a hydromassage bath, works in synergy with the mud, providing an anti-inflammatory and analgesic effect for various pathologies: muscle-tendon-bone. In addition, the action of the sulphurous water, directed onto the body by special jets, has a relaxing effect making it suitable for all those who suffer from muscular pains, of various origin (tension from stress, trauma, etc. ..). Thethermalmud is produced by mixing a solid component, clay with thermal waters. The sulphurouswaterscharacteristic of these spas are what give the mud its anti-inflammatory properties. The heat of the mud (38-40°C) facilitates the penetration of sulphur, the active ingredient of these waters. The mud is an ideal means for healing chronic post-traumatic and osteoarticular pathologies. The treatment is followed by a hot bath to allow the entire body to relax and benefit from the water's effect. Thesulphurous thermal waterexerts an anti-inflammatory and sebum-regulating effect on the skin. It is therefore particularly suitable for dermatological pathologies such as psoriasis (better if associated with phototherapy), acne, seborrheic dermatitis, skin allergies and mycosis. Of particular note is the specific benefit that patients with pityriasis versicolor, sometimes called tinea versicolor, can gain. Balneotherapy consists of full or partial immersion in hot thermal water for a duration and at a temperature determined by the doctor on a case-by-case basis. The temperature of the water is usually about 36°-37° degrees, and the patient must present himself for treatment on an empty stomach or have fasted for 3-4 hours. After about 15-20 minutes immersed in the hot thermal water, the patient is covered well and left to relax on a lounger for a further 20 minutes, thereby undergoing a period of "reaction time" in which the positive effects induced by the bath, particularly vascular, are completed. 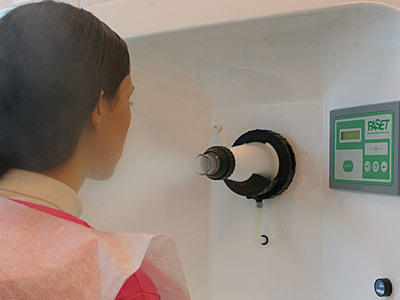 A treatment cycle consists of 12 baths performed once a day. The most noteworthy actions of balneotherapy are local, resulting from contact of thethermal waterwith the skin. These actions can be summarised as keratoplastic, keratolytic, anti-inflammatory, antipruritic, antiparasitic, antimicrobial and sebum reducing. The keratoplastic action stimulates the epithelium, promoting regeneration and keratinisation of the skin where lesions are present, and thereby healing the skin. The keratolytic effect is determined by the exfoliating properties of sulphur and skin renewal and/or the elimination or reduction of desquamated skin where present will occur. The thermal water has an anti-inflammatory action on contact with the skin resulting from oxygen subtraction, thus reducing itching. The thermal water’s anti-parasitic and antimicrobial properties are also related to this reduction activity. Thethermal wateralso performs an anti-seborrheic and sebum-reducing action on the skin, once again thanks to the substantial presence of sulphur. It should also be noted that the absorption of minerals that takes place during balneotherapy, above all through inhalation, has a positive influence in treating metabolic disorders, alterations of an allergic type, states of intoxication and liver and digestive tract disorders, conditions which often lie at the base of some cutaneous pathologies, as in the pathogenesis of eczema for instance. Balneotherapy is also beneficial in the treatment of diseases of the arteries and veins. Among the peripheral arterial diseases which balneotherapy can benefit are atherosclerosis and diabetic peripheral arterial disease. Among venous diseases there are positive indications for postphlebitic syndrome secondary circulatory disorders, responsible for oedema and dystrophies. A complete treatment for PSORIASIS and many skin diseases. Immersion in hot water has a rejuvenating effect on the skin and relaxes the entire body. 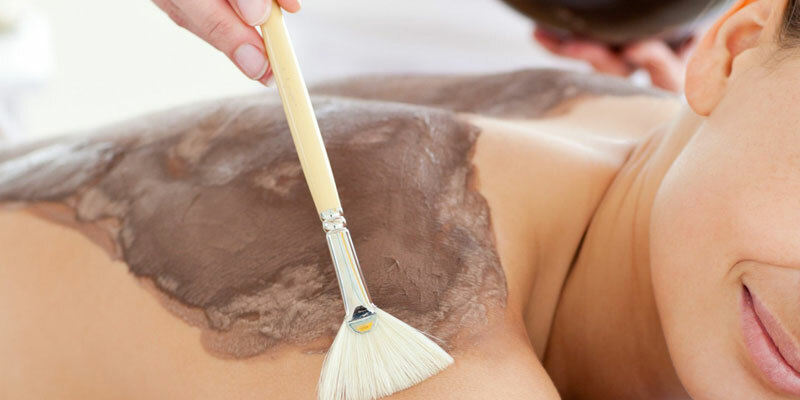 It is a useful alternative to mud therapy for those patients with contraindications. It also has a regenerating and soothing effect on the skin. A complete treatment for PSORIASIS and all skin diseases (dermatitis, eczema, fungal infections, etc.). The soothing and anti-inflammatory action of the sulphurous hot bath is combined with phototherapy, a special UVA and UVB lamp required to eliminate inflammation from the deeper layers of the skin and to accelerate its regeneration. 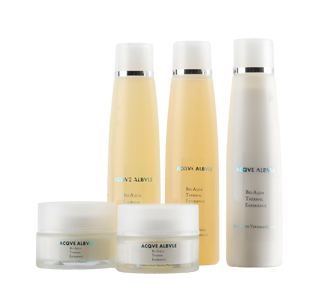 The smoothing effect of ozone works in combination with the muscle relaxant action of the sulphurous waters, penetrating the skin to combat free radicals and promote cellular balance. The pathologies of the middle ear and tube which can lead to hypoacusis or rhinogenous hearing loss are closely related to those of the nose and pharynx. It is therefore essential to combine tubal insufflation with inhalation treatment. Endo-tympanic insufflation is a stand-alone treatment for those who suffer from rhinogenous hearing loss. Rhinogenous hearing loss refers to a set of pathological conditions that cause transmissive hypoacusis linked to the inflammatory processes in the rhinopharynx, the Eustachian tube and the middle ear. The insufflations are performed exclusively by medical specialists in Otolaryngology and Medical Hydrology, by introducing a small tube into the patient’s nose (Itard catheter). Once the catheter has been driven as far as the pharyngeal opening of the Eustachian tube, the physician introduces (insufflates) sulphur gas at low pressure via the catheter into the Eustachian tube. The gas is released due to the bubbling of the sulphurous water and it flushes the tubal blockages, helping the tube itself and tympanic cavity to free itself from any secretions that may be present. Hydropinic therapy refers to the oral administration of sulphuric water, whose doses and procedures are established by the treating physician, based on the patient's pathology. The presence of other trace elements in addition to sulphur and magnesium bestows our waters with exceptional beneficial properties useful in the treatment of constipation, common chronic conditions, and biliary calculus. Spa treatments are covered by Italy’s national health service (SSN). The SSN (Servizio sanitario nazionale) provides for one treatment cycle per year. What should one do to access treatment covered by the NHS? Present yourself at the spa’s registration desk with your GP referral (the pink prescription)as provided by your GP, and on which the medical condition, diagnosis and treatment to be carried out should be indicated (see summary diagram D.M. 15/12/1994). Pay the prescription charge, a total of 55.00 Euro (as of 1 January 2016, with the exception of those who are exempt who should pay 3.10 Euro on presentation of the prescription with exemption code issued by their local NHS, according to the thermal care). Undergo a medical examination at our spa clinicto check the patient does not present contraindications concerning the treatment as prescribed by the GP. (The examination is mandatory but there is no charge as it is already included in the payment of the prescription charge and SSN cover). What should one do during the covered treatment? A personal file (for mud balneotherapy and balneotherapy treatments only) that must be presented to the spa treatment staff on a daily basis. If the doctor deems it appropriate, he will provide you with additional guidance on making use of the treatment. What should one do at the end of the treatment? Certification of the treatment cycle performed may be requested when required for work purposes. The contribution to health service costs is € 55.00 (from 1 January 2016) and entitles you to one course of treatment (12 days) on the SSN per year. Thermal treatments covered by INPS at the Terme di Roma - Acque Albule S.p.A.
- request for ancillary care. An annual cycle of thermal therapy takes place over 12 treatment days (13-day stay) INPS may re-authorise up to 5 cycles (5 years) in those cases where the medico-legal conditions required for the allocation of treatment remain. For full information, consult the INPS website byclicking here or visit your local INPS office..